Perhaps the most important, but often undervalued steps to starting a business in Florida is writing a business plan. The second step to start a new business in Florida is selecting a business entity. General Partnerships consist of two or more people conducting a business together. Like the sole proprietorship, the partnership has unlimited liability. If the partnership were to be sued, each of the partner’s personal assets are potentially at risk. The partnership itself does not pay tax from business income. Instead, profits and losses are passed through to the owner’s personal tax return. This income is subject to self-employment tax. General partnerships cost $50 to file the Partnership Registration Statement and are filed with the Florida Division of Corporations. The cost to form a corporation in Florida is $35. The Articles of Incorporation must be filed with the Florida Department of State, Division of Corporations. 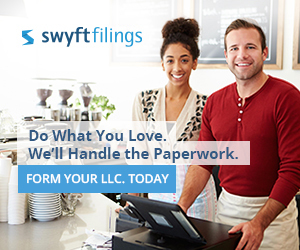 The cost to file the Articles of Organization and form an LLC in Florida is $125. 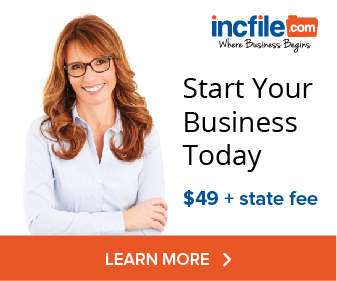 Learn how to file a Florida LLC with our step-by-step guide. After deciding on a business entity, the next step in starting a business in Florida is to register a business name. If you are a sole proprietorship or general partnership in Florida and doing business under your full first and last name, John Smith, for example, there is no filing, but if the business will operate under a Fictitious Name (sometimes referred to as an assumed name, trade name or Doing Business As/DBA) like John Smith’s Handyman Service, Mr. Handyman, etc, you will need to register the business name by filing a Fictitious Name registration (DBA) with the State of Florida. In addition to the state filing, the name being registered must be advertised at least once in a newspaper that is located within the county where your business is located. Proof of the advertisement is not required, but you will have to certify the name has been advertised when you sign the application. The fee is $50 to register a Fictitious Name. Learn how to register a Fictitious Name in Florida. Check the availability of Florida corporation or LLC names. To start a business in Florida, a company may require special permits and/or licensing. While there is no general state of Florida business license, a business may need to register with a variety of agencies before opening. Florida Business Tax Application – The most common registration for businesses in Florida is the Business Tax Application (also known as a seller’s permit). This application is required for businesses that sell goods at retail or providing certain services. Generally speaking, physical products sold at retail are charged sales tax, while services are generally not taxable. A few taxable services include investigative and crime protection services, interior nonresidential cleaning services, and nonresidential pest control services. More information about the Florida Business Tax Application (Form DR-1) and how to register are available from the Florida Department of Revenue. The paper filing will cost $5 however, there is no cost to apply online. Professional & Occupational Licenses – A variety of professionals in the state are regulated such as accountants, home inspectors, landscapers, veterinarians and many more. Additional information and fees for regulated professions are available from the State of Florida. In addition to professional licenses, businesses in a variety of industries such as food establishments, day cares, salvage yards and many others also require licensing. Local Business Licenses – Most cities, towns and/or counties in Florida require a business to register, even occasionally those that are home-based businesses. Each local entity has its own rules for business activity, so requirements vary depending on location as some require a business license while others have requirements for zoning, building/ building improvements, signage requirements, liquor licenses, etc. Register as an Employer – Employers will need to register with the IRS (EIN number) Florida Department of Revenue (State Reemployment Taxes). Fill Out Paperwork For New Employees – When hiring a new employee there are four forms that will need to be filled out; New-Hire Reporting Form (Florida Department of Revenue), I9 (Form I-9, Employment Eligibility Verification), W-4 (IRS’s Publication 15 Employer Tax Guide), and the (Florida Employee Withholding Exemption Certificate). Worker’s Compensation Insurance – Workers’ compensation provides compensation benefits and covers medical costs to employees injured on the job. Worker’s Compensation Insurance is administered through the Florida Division of Workers’ Compensation. Consult with the Florida Department of Labor and U.S. Department of Labor to learn more. If you are unsure of your obligations, an attorney’s guidance can be also useful in assisting you to meet legal requirements.